Photography - Trial and Error way: Underexpose Your Indoor or Low-light Photos- A Better Photography Tip. Underexpose Your Indoor or Low-light Photos- A Better Photography Tip. Many times in low light or for indoor photos, your compact camera or your kit lens on SLR may not take nice sharp photos. It is not your camera's fault. It happens because light is low so to get enough light in, camera has to keep the shutter open for longer time (slow shutter speed). Most cameras have lenses which don't open much wide open beyond their hardware limitation so Aperture/lens opening is not much of an alternative. So camera has two things to play around with. 1) Either keep the shutter open for longer time or increase ISO. Higher ISO can result in noisy image. Most compact cameras have distinct noise for ISO higher than 400. For ISO above 1600, most images are unuable. However if you really want to capture a photo, this ISO can come handy. 2) If shutter is kept slow so enough light can get in, this can result in camera shake in your hands or the subject in front of you can move too. This results in blurry or shaky image. Normally any shutter speed slower than 1/75 second can result in blurry image. One more solution in such situation is to use Exposure Compensation and tell your camera that it is okay to take in a little less light. 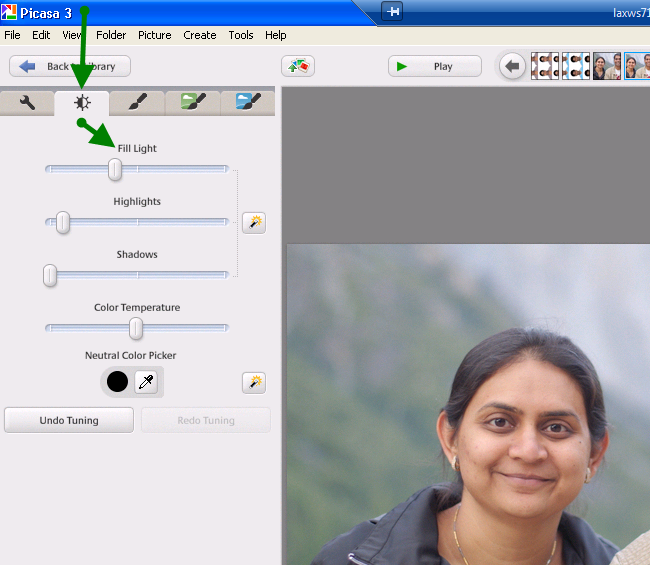 This will cause your photo to be a bit darker but camera will be able to use a bit faster shutter speed or a lower ISO. A bit darker photo then can easily be fixed in Picasa or any image editor software. Underexpose your photos to -1/3 value or if in dark, you can even try with -2/3. * Take a bit underexposed photos. For indoor and in low light (and many times outdoor too), I use EV (Exposure Value) Compensation on the camera. This is the button with +/- sign on it. Then move the scrolling button or left and right arrow to set the value to -1/3 as shown in image here. What is the benefit of doing this? This setting tells your camera that it is okay to have a little bit darker image. This helps camera to take in less light so camera a can use a little lower ISO or a bit faster shutter speed. This causes the image to be a bit less noisy or it reduces camera’s shake or movement of the subject a bit lower as camera shutter speed is likely to be faster. The drawback is a bit darker image. When I move such photos to my camera, I make the photo a bit brighter in Picasa. The other logic behind this is that an underexposed photo (a dark photo) can be easier to fix in post-processing on the computer than an overexposed photo. In an over-exposed photo, if some detail is lost, sometimes you can’t bring it in but if the photo is under-exposed, you can probably add some light and make it look better. Remember one more thing. We are talking about low light or indoor photos. As you might have read in earlier posts, one good alternative is to add some artificial light or use camera flash. Your camera will love this and with more light around, it will be able to take better photos easily. If with flash, the face is washed out, as it often happens with compact cameras, you can use the same Exposure Compensation and ask camera to take less light in. This will avoid washed out photos in flash photography too. Enjoy your camera. Actually, your camera can take better photos even in tough light if you are willing to help it a bit.